Euro-zone’s unemployment rate and Germany’s final manufacturing PMI both declined for September. EUR bulls are trying to win against the strong USD. 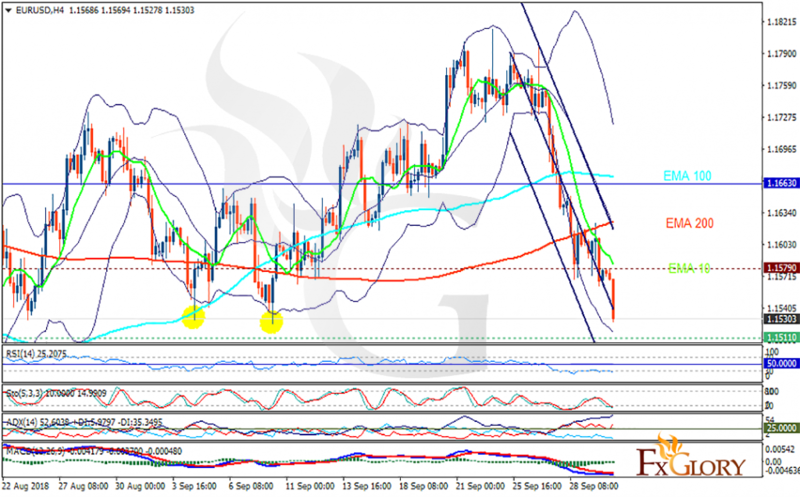 The support rests at 1.15110 with resistance at 1.15790 which both lines are below the weekly pivot point at 1.16630. The EMA of 10 is moving with bearish bias in the descendant channel and it is below the EMA of 200 and the EMA of 100. The RSI is moving in the oversold area, the Stochastic is moving in low ranges and the MACD line is below the signal line in the negative territory. The ADX is showing strong sell signal. It seems that 1.15 is a strong support area for EURUSD, buyers can return to market soon targeting the upper Bollinger band.